Designed by George Bernard Shaw, the window features a caption across the top which proclaims to Remould it nearer to the heart's desire, as the earth is heated up and hammered upon. The caption phrase is a pull quote from the Rubaiyat of Omar Khayyam. 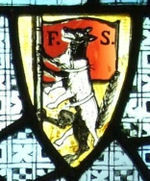 The Fabian Society has for its coat of arms a wolf in sheep's clothing. This can be prominently seen in the window with the two letters "F. S.". ↑ A piece of Fabian history unveiled at LSE. LSE News (April 20, 2006). ↑ Never Call Socialism by Its Right Name. American Thinker. This page was last modified on 26 September 2018, at 10:58.